This light and refreshing smoothie is a great afternoon snack and a wonderful way to support your body’s detoxification processes. Dandelion root tea and lemon aid the liver and digestive system, while berries and flaxseeds are a wonderful source of antioxidants. Tip: You can save time by boiling the tea ahead of time and then letting it cool in the refrigerator. If you prefer this option, boil 1½ cups of water, add the tea bag and let it steep for 15 minutes; remove the tea bag, and then cool the tea in the refrigerator for several hours or overnight. Enjoy in a smoothie when cold! Add the water to a small pot, cover and bring to a rolling boil. Remove from heat. Add the tea bag and let the tea steep, covered, for 15 minutes. Squeeze the tea bags of excess liquid and then remove from the pot. 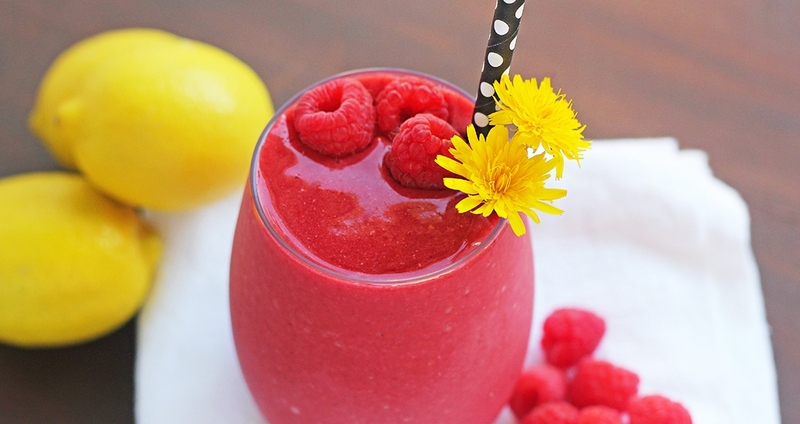 Add the tea, ice, honey or maple syrup (if using), frozen berries, lemon juice and flaxseeds to a blender. Blend until smooth, then enjoy immediately.